I’ve recently had a pizza related fantasy which has gotten me quite excited. Imagine how delicious it would be to have one large pizza made up of slices of pizzas from all different pizza businesses – it wouldn’t be much larger than a regular pizza, but one slice would be Domino’s, one slice would be Pizza Express, one slice would be Stone Willy’s (a local chain), one would be Co-Operative brand pizza and then on like that, with Yammo, Pizza Hut and all the other ones I like mixed in there too. It would be really exciting to have a pizza party with ten friends, buy ten pizzas from ten different places and then make ten holy pizzas made out of all those other delicious pizzas. I like to think that I will actually do this one day. 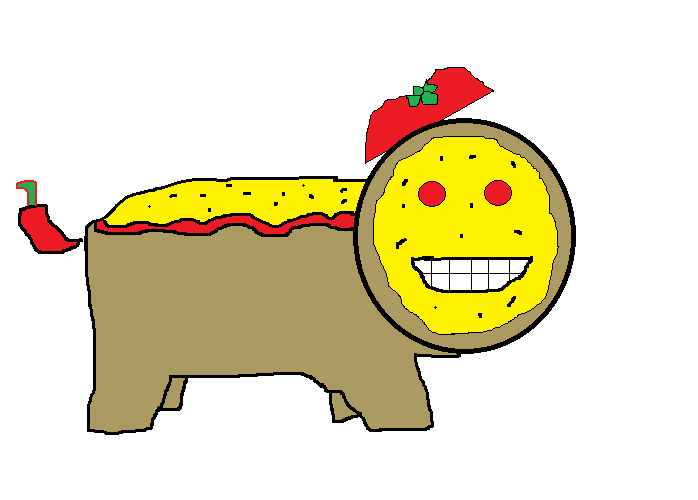 In the meantime, here’s a picture of the Pizza Creature.